This article is about the town in Morris County. For other uses, see Morristown, New Jersey (disambiguation). Morristown /ˈmɒrɪstaʊn/ is a town and the county seat of Morris County, New Jersey, United States. Morristown has been called "the military capital of the American Revolution" because of its strategic role in the war for independence from Great Britain. Today this history is visible in a variety of locations throughout the town that collectively make up Morristown National Historical Park. The Green, a historic park, serves as a gathering place and a center of culture within Downtown Morristown. 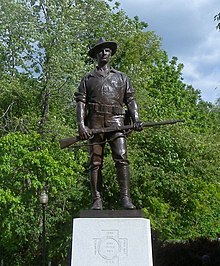 Military Capital of the American Revolution, Mo Town, "The Mo", Mo City"
According to British colonial records, the first permanent European settlement at Morristown occurred in 1715, when a settlement was founded as New Hanover by migrants from New York and Connecticut. 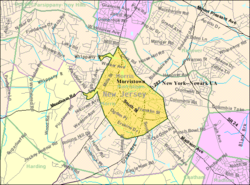 Morris County was created on March 15, 1739, from portions of Hunterdon County. The county, and ultimately Morristown itself, was named for the popular Governor of the Province, Lewis Morris, who championed benefits for the colonists. Morristown was incorporated as a town by an act of the New Jersey Legislature on April 6, 1865, within Morris Township, and it was formally set off from the township in 1895. As of the 2010 United States Census, the town's population was 18,411, reflecting a decline of 133 (-0.7%) from the 18,544 counted in the 2000 Census, which had in turn increased by 2,355 (+14.5%) from the 16,189 counted in the 1990 Census. The area was inhabited by the Lenni Lenape Native Americans for up to 6,000 years prior to exploration of Europeans. The first European settlements in this portion of New Jersey were established by the Swedes and Dutch in the early 17th century, when a significant trade in furs existed between the natives and the Europeans at temporary posts. It became part of the Dutch colony of New Netherland, but the English seized control of the region in 1664, which was granted to Sir George Carteret and John Berkeley, 1st Baron Berkeley of Stratton, as the Province of New Jersey. In 1777, General George Washington and the Continental Army marched from the victories at Trenton and Princeton to encamp near Morristown from January to May. Washington had his headquarters during that first encampment at Jacob Arnold's Tavern located at the Morristown Green in the center of the town. Morristown was selected for its extremely strategic location. It was between Philadelphia and New York and near New England while being protected from British forces behind the Watchung Mountains. It also was chosen for the skills and trades of the residents, local industries and natural resources to provide arms, and what was thought to be the ability of the community to provide enough food to support the army. From December 1779 to June 1780 the Continental Army's second encampment at Morristown was at Jockey Hollow. Then, Washington's headquarters in Morristown was located at the Ford Mansion, a large mansion near what was then the 'edge of town.' Ford's widow and children shared the house with Martha Washington and officers of the Continental Army. The idea for constructing the Morris Canal is credited to Morristown businessman George P. Macculloch, who in 1822 convened a group to discuss his concept for a canal. The group included Governor of New Jersey Isaac Halstead Williamson, which led to approval of the proposal by the New Jersey Legislature later that year. The canal was used for a century. In July 1825 during his 15 month return tour of the United States, the Marquis de Lafayette returned to Morristown, where a ball was held in his honor at the 1807 Sansay House on DeHart Street (the edifice still stands as of 2011). 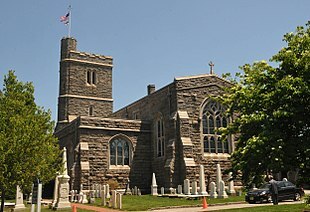 In 1827, St. Peter's Episcopal Church was founded at the behest of Bishop George Washington Doane and many prominent Morristown Families, including George P. Macculloch, of the Morris Canal. When the Church was rebuilt by McKim, Mead and White beginning in 1889, the congregation erected one of the United States finest church buildings –a stone, English-gothic church complete with fined stained glass, and a long, decorated interior. Antoine le Blanc, a French immigrant laborer, murdered the Sayre family and their servant (or possibly slave), Phoebe. He was tried and convicted of murder of the Sayres (but not of Phoebe) on August 13, 1833. On September 6, 1833, Le Blanc became the last person hanged on the Morristown Green. Until late 2006, the house where the murders were committed was known as "Jimmy's Haunt," which is purported to be haunted by Phoebe's ghost because her murder never saw justice. Jimmy's Haunt was torn down to make way for a bank in 2007. On December 18, 1843, the Bethel African Methodist Episcopal Church was incorporated. This was the first congregation established by blacks in Morris County. It is still active. The first site of the Church was located at 13 Spring Street and served as the only schoolhouse for colored children until 1870. The Church relocated to its present site at 59 Spring Street in 1874. According to the United States Census Bureau, Morristown had a total area of 3.026 square miles (7.839 km2), including 2.929 square miles (7.587 km2) of land and 0.097 square miles (0.252 km2) of water (3.22%). Morristown is completely surrounded by Morris Township, making it part of 21 pairs of "doughnut towns" in the state, where one municipality entirely surrounds another. Morristown has a humid continental climate (Köppen climate classification Dfa/Dfb). As of the 2010 United States Census, there were 18,411 people, 7,417 households, and 3,649.164 families residing in the town. The population density was 6,284.9 per square mile (2,426.6/km2). There were 8,172 housing units at an average density of 2,789.6 per square mile (1,077.1/km2). The racial makeup of the town was 62.50% (11,507) White, 13.97% (2,572) Black or African American, 0.64% (117) Native American, 4.34% (799) Asian, 0.06% (11) Pacific Islander, 14.84% (2,732) from other races, and 3.66% (673) from two or more races. Hispanic or Latino of any race were 34.09% (6,277) of the population. There were 7,417 households out of which 22.7% had children under the age of 18 living with them, 31.1% were married couples living together, 12.0% had a female householder with no husband present, and 50.8% were non-families. 38.8% of all households were made up of individuals, and 9.5% had someone living alone who was 65 years of age or older. The average household size was 2.40 and the average family size was 3.13. In the town, the population was spread out with 17.6% under the age of 18, 9.7% from 18 to 24, 38.4% from 25 to 44, 22.9% from 45 to 64, and 11.5% who were 65 years of age or older. The median age was 34.8 years. For every 100 females there were 104.5 males. For every 100 females ages 18 and older there were 106.1 males. As of the 2000 United States Census there were 18,544 people, 7,252 households, and 3,698 families residing in the town. The population density was 6,303.9 people per square mile (2,435.3/km2). There were 7,615 housing units at an average density of 2,588.7 per square mile (1,000.1/km2). The racial makeup of the town was 67.63% White, 16.95% Black or black, 0.22% Native American, 3.77% Asian, 0.06% Pacific Islander, 8.48% from other races, and 3.36% from two or more races. Hispanic or Latino people of any race were 27.15% of the population. In the town, the population was spread out with 18.4% under the age of 18, 8.8% from 18 to 24, 40.4% from 25 to 44, 20.0% from 45 to 64, and 12.4% who were 65 years of age or older. The median age was 35 years. For every 100 females, there were 100.6 males. For every 100 females age 18 and over, there were 99.7 males. Companies based in Morristown include Covanta Energy, Louis Berger Group, Schindler Group and the Morristown & Erie Railway , a local short-line freight railway and Honeywell. Morristown Medical Center, with 5,500 employees, is Morristown's largest employer. In a ruling issued in June 2015, Tax Court Judge Vito Bianco ruled that the hospital would be required to pay property taxes on nearly all of its campus in the town. Morristown National Historical Park — Four historic sites around Morristown associated with the American Revolutionary War, including Jockey Hollow, a park that includes a visitor center, the Revolution-era Wick farm, encampment site of George Washington's Continental Army, and around 25 miles of hiking trails, and the Washington's Headquarters & Ford Mansion, a Revolution-era Georgian-style mansion used by George Washington as his headquarters during the Jockey Hollow encampment. Morristown Green – Park at the center of town which was the old town "common" or "green." It is the site of several Revolutionary War and Civil war monuments, and is surrounded by historic churches, the colonial county-courthouse, and a shopping and restaurant district. St. Peter's Episcopal Church — Large McKim Mead and White church with bell tower, fine stained glass and medieval furnishings. Acorn Hall – 1853 Victorian Italianate mansion and home to the Morris County Historical Society. Donated to the historical society in 1971 by Mary Crane Hone, the mansion retained much of its original furnishings and accouterments as it remained in the same family for over a century. It is currently operated as a museum and is the headquarters of the Morris County Historical Society. Morris Museum – formally incorporated in 1943. The museum's permanent displays include rocks, minerals, fossils, animal mounts, a model railroad, and Native American crafts, pottery, carving, basketry and textiles. Mayo Performing Arts Center is a former Walter Reade movie theater originally constructed in 1937 that has been converted into a 1,302-seat performing arts center. Speedwell Ironworks is a National Historic Landmark and museum at the site where the electric telegraph was first presented to the public, on January 11, 1838. The United States Equestrian Team, the international equestrian team for the United States, was founded in 1950 at the Coates estate on van Beuren Road in Morristown. The Morristown 1776 Association Football Club is a soccer club that competes in the North Jersey Soccer League and MCSSA. Morristown is governed within the Faulkner Act, formally known as the Optional Municipal Charter Law, under a Plan F Mayor-Council system of New Jersey municipal government, which went into effect on January 1, 1974. The Morristown Town Council consists of seven members: three members elected at-large representing the entire town; and four members representing each of the town's four wards. Members are elected to four-year terms of office on a staggered basis; there is an election every two years, either for the four ward seats or for the at-large and mayoral seats. As the legislative arm of the government, the council is responsible for making and setting policy for the town. As of 2017[update], the Mayor of Morristown is Democrat Timothy Dougherty, whose term of office ends December 31, 2017. Members of the Morristown Town Council are Stefan Armington (D, Ward III, 2019), Council President Toshiba Foster (D; At Large, 2017),Council Vice President, Hiliari B. Davis (D, Ward II, 2019), Alison A. Deeb (R; Ward IV, 2019), Michael Elms (D, At Large, 2017), Michelle Dupree Harris (D; At Large, 2017) and Robert Iannaccone (R, Ward I, 2019). In the 2012 presidential election, Democrat Barack Obama received 67.1% of the vote (4,485 cast), ahead of Republican Mitt Romney with 31.7% (2,117 votes), and other candidates with 1.2% (79 votes), among the 6,727 ballots cast by the town's 10,212 registered voters (46 ballots were spoiled), for a turnout of 65.9%. In the 2008 presidential election, Democrat Barack Obama received 68.1% of the vote (4,738 cast), ahead of Republican John McCain with 30.0% (2,084 votes) and other candidates with 1.0% (67 votes), among the 6,953 ballots cast by the town's 9,741 registered voters, for a turnout of 71.4%. In the 2004 presidential election, Democrat John Kerry received 62.8% of the vote (4,138 ballots cast), outpolling Republican George W. Bush with 35.9% (2,370 votes) and other candidates with 0.5% (53 votes), among the 6,593 ballots cast by the town's 9,890 registered voters, for a turnout percentage of 66.7. In the 2013 gubernatorial election, Republican Chris Christie received 52.7% of the vote (1,871 cast), ahead of Democrat Barbara Buono with 45.2% (1,602 votes), and other candidates with 2.1% (75 votes), among the 3,780 ballots cast by the town's 10,124 registered voters (232 ballots were spoiled), for a turnout of 37.3%. In the 2009 gubernatorial election, Democrat Jon Corzine received 52.1% of the vote (2,263 ballots cast), ahead of Republican Chris Christie with 37.4% (1,623 votes), Independent Chris Daggett with 8.1% (350 votes) and other candidates with 0.4% (16 votes), among the 4,340 ballots cast by the town's 9,393 registered voters, yielding a 46.2% turnout. The Morris School District is a regional public school district that serves students in pre-kindergarten through twelfth grade from the communities of Morristown and Morris Township, and high school students (grades 9-12) from Morris Plains who attend the high school as part of a sending/receiving relationship with the Morris Plains Schools. As of the 2014-15 school year, the district and its 10 schools had an enrollment of 5,123 students and 426.7 classroom teachers (on an FTE basis), for a student–teacher ratio of 12.0:1. Schools in the district (with 2014-15 enrollment data from the National Center for Education Statistics) are Lafayette Learning Center (PreK; 176 students), Hillcrest School (K-2; 318), Alfred Vail School (K-2; 332), Woodland School (K-2; 305), Alexander Hamilton School (3-5; 271), Thomas Jefferson School (3-5; 317), Sussex Avenue School (3-5; 323), Normandy Park School (K-5; 368), Frelinghuysen Middle School (6-8; 1,144) and Morristown High School (9-12; 1,678). In addition to a public school system, Morristown has several private schools. Primary and elementary schools include The Red Oaks School, a Montessori school serving students from pre-school through grade eight. Assumption Roman Catholic is a grade school (K-8) that operates under the auspices of the Roman Catholic Diocese of Paterson and was one of 11 schools in the state recognized in 2014 by the United States Department of Education's National Blue Ribbon Schools Program. The Peck School, a private day school which serves approximately 300 students in kindergarten through grade eight, dates back to 1893 when it was originally established as Miss Sutphen's School. The Delbarton School is an all-boys Roman Catholic school with approximately 540 students in grades seven through twelve, that began serving resident students in 1939 after having previously served as a seminary. The Morristown-Beard School, a private co-ed school formed from the merger of two previously existing institutions, Morristown Preparatory School and Miss Beard's School, serves grades 6 through 12. In addition, Villa Walsh Academy, a private Catholic college preparatory school conducted by the Religious Teachers Filippini, is located in Morristown. As of May 2010[update], the town had a total of 39.98 miles (64.34 km) of roadways, of which 29.73 miles (47.85 km) were maintained by the municipality, 5.03 miles (8.10 km) by Morris County and 5.22 miles (8.40 km) by the New Jersey Department of Transportation. Interstate 287 is the main highway providing access to Morristown. Two interchanges, Exit 35 and Exit 36, are located within the town. Other significant roads serving Morristown include U.S. Route 202, New Jersey Route 124 and County Route 510. Morristown has attempted to implement transit-oriented development. Morristown was designated in 1999 as of one of New Jersey's first five "transit villages". In 1999, Morristown changed its zoning code to designate the area around the train station as a "Transit Village Core" for mixed-use. The designation was at least partly responsible for development plans for several mixed-use condominium developments. NJ Transit offers rail service at the Morristown station which offers service on the Morristown Line to Newark Broad Street, Secaucus Junction, New York Penn Station and Hoboken Terminal. The town benefited from shortened commuting times to New York City due to the "Midtown Direct" service New Jersey Transit instituted in the 1990s. NJ Transit local bus service is offered from the Morristown rail station, Morristown Medical Center and Headquarters Plaza on the 871, 872, 873, 874, 875 and 880 bus routes, replacing service that had been offered on the MCM1, MCM2, MCM3, MCM4, MCM8 and MCM10 routes until 2010, when subsidies to the local provider were eliminated as part of budget cuts. The town's Department of Public Works operates "Colonial Coach", which provides free transportation within Morristown. WJSV radio (90.5 FM) is the nonprofit radio station of Morristown High School, which also has a television show, Colonial Corner. One of only two heroic statues of Thomas Paine in the United States is located in Morristown; the other is found in Bordentown, NJ. See also: Category:People from Morristown, New Jersey. Frank D. Abell (1878-1964), politician who served in the New Jersey General Assembly in 1925 and 1926 and the New Jersey Senate from 1926 to 1931. Joseph Bushnell Ames (1878-1928), novelist. Markus Howard (born 1999), player for the Marquette Golden Eagles men's basketball team. Julia Hurlbut (1882-1962), suffragist who served as the vice chairman of the New Jersey branch of the National Woman's Party. Otto Hermann Kahn (1867–1934), German-born banker, investor, philanthropist and Rutgers University trustee maintained a home in Morristown. Nolan Kasper (born 1989), World Cup alpine ski racer who competes in the technical events and specializes in the slalom. Ted Koffman (born 1944), politician who served in the Maine House of Representatives from 2000 to 2008. John Panelli (1926-2012), American football player who played in the NFL for the Detroit Lions and the Chicago Cardinals. Debra Ponzek, chef who is the owner of Aux Délices restaurants in Connecticut. Dan Quinn (born 1970), football defensive coordinator for the Super Bowl XLVIII champion Seattle Seahawks and head coach of the Atlanta Falcons in Super Bowl LI. Rick Rescorla (1939-2001), head of Morgan Stanley World Trade Center security during the September 11 terrorist attacks. William P. Richardson (1864–1945), co-founder and first Dean of Brooklyn Law School. Leila Clement Spaulding (1878-1973), classicist and archaeologist. Kathryn Tappen (born 1981), sportscaster who works on NBC Sports Group's coverage of hockey and football. Jahmar Thorpe (born 1984), professional basketball player for the Iwate Big Bulls in Japan. Bayard Tuckerman Jr. (1889-1974), jockey, businessman and politician. ^ a b Mayor Timothy Dougherty, Town of Morristown. Accessed May 17, 2017. ^ Administration, Town of Morristown. Accessed July 25, 2016. ^ Staff Directory, Town of Morristown. Accessed July 25, 2016. 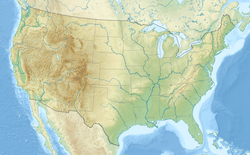 ^ U.S. Geological Survey Geographic Names Information System: Town of Morristown, Geographic Names Information System. Accessed March 8, 2013. ^ a b c Profile of General Demographic Characteristics: 2010 for Morristown town Archived May 13, 2012, at the Wayback Machine, New Jersey Department of Labor and Workforce Development. Accessed July 19, 2012. ^ Area Code Lookup - NPA NXX for Convent Station, NJ, Area-Codes.com. Accessed September 6, 2014. ^ Geographic Codes Lookup for New Jersey, Missouri Census Data Center. Accessed July 19, 2012. ^ Table 7. 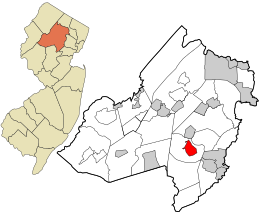 Population for the Counties and Municipalities in New Jersey: 1990, 2000 and 2010 Archived May 20, 2013, at the Wayback Machine, New Jersey Department of Labor and Workforce Development, February 2011. Accessed July 19, 2012. ^ Whatever happened to Washington's 1777 HQ in Morristown? Archived April 25, 2005, at the Wayback Machine, accessed May 7, 2006. ^ The "Hard" Winter of 1779—80 Archived October 23, 2012, at the Wayback Machine, National Park Service. Accessed March 17, 2006. ^ New Jersey and National Registers of Historic Places - Morris County Archived October 24, 2012, at the Wayback Machine, New Jersey Department of Environmental Protection Historic Preservation Office, updated January 22, 2015. Accessed September 8, 2015. ^ Staff. "Paine Statue Unveiled; 3,000 at Morristown Ceremony in Memory of Patriot", The New York Times, July 5, 1950. Accessed July 24, 2018. "Morristown, N.J., July 4-- While 3,000 persons watched under heavily overcast skies a $75,000 Thomas Paine statue was dedicated this afternoon at Burnham Park." ^ A Brief History, Morris Canal Greenway. Accessed August 20, 2011. "George P. Macculloch, a Morristown businessman, must be given the credit for conceiving the idea for the Morris Canal and ultimately carrying it through to completion. In 1822 he brought a group of interested citizens together at Morristown including Governor Isaac Williamson to discuss his idea with them. His proposal was received favorably." ^ "Morristown - St Peter's". njchurchscape.com. Retrieved April 25, 2017. ^ Historic Speedwell Archived November 26, 2010, at the Wayback Machine, Morris County, New Jersey Parks Commission. Accessed August 20, 2011. "The most significant building at Historic Speedwell is the Factory, a National Historic Landmark where Stephen Vail's son, Alfred, worked with Samuel F. B. Morse to perfect the telegraph. It was here on January 11, 1838 where the electromagnetic telegraph was first publicly demonstrated - making Historic Speedwell the 'Birthplace of the Telegraph.'" ^ Staff. "Coming back home again; Morristown High grad will lead choir in concert at Bethel A.M.E. Church", Daily Record (Morristown), June 17, 2004. Accessed December 17, 2012. "Sandra Singleton Barnhardt, a 1969 graduate of Morristown High School, will come home to Bethel A.M.E. Church, the oldest black church in Morris County, to host a benefit Saturday beginning at 6 p.m."
^ Average Weather for Morristown, New Jersey - Temperature and Precipitation Archived October 23, 2012, at the Wayback Machine, Weather.com. Accessed March 28, 2008. ^ a b c d e Census 2000 Profiles of Demographic / Social / Economic / Housing Characteristics for Morristown town Archived June 5, 2012, at the Wayback Machine, United States Census Bureau. Accessed December 27, 2011. ^ Darragh, Tim. "Morristown hospital loses property tax court case; judge says facility does not meet non-profit status", NJ Advance Media for NJ.com, June 26, 2015. Accessed July 25, 2016. "Morristown Medical Center should pay property taxes on virtually all of its 40-acre property in town, a tax court judge ruled Friday in a decision closely watched by other hospitals across New Jersey.... The hospital, which employs 5,500 people, is the largest employer in Morristown." ^ History, Morris County Historical Society. Accessed January 4, 2018. "Mary Crane Hone presented the Society with Acorn Hall and five acres of surrounding property in 1971. Built in 1853, Acorn Hall was the home of several generations of the Crane-Hone family." ^ Mission and History, Morris Museum. Accessed July 25, 2016. ^ Theatre History, Mayo Performing Arts Center. Accessed July 25, 2016. ^ Historic Speedwell, Morris County Tourism Bureau. Accessed April 1, 2019. "This eight-acre National Historic Landmark has established its place in world history several times over. It was here in 1838, at the start of the Industrial Revolution, that Samuel F.B. Morse and Alfred Vail demonstrated a perfected electromagnetic telegraph to the public." ^ Moorehead, Daniel (November 3, 2015). Animals In Human Society: Amazing Creatures Who Share Our Planet. UPA. ISBN 9780761866770. ^ Home Page, Indoor Cricket USA. ^ Morris County Manual 2006: Town of Morristown Archived April 23, 2007, at the Wayback Machine, Morris County, New Jersey. Accessed April 17, 2007. ^ Town Council Directory, Town of Morristown. Accessed May 17, 2017. ^ 2017 Municipal User Friendly Budget, Town of Morristown. Accessed May 17, 2017. ^ Morris County Manual 2017, Morris County, New Jersey Clerk. Accessed May 17, 2017. ^ November 5, 2013 General Election Winners Archived January 19, 2015, at the Wayback Machine, Morris County, New Jersey Clerk. Accessed July 19, 2016. ^ 2017 New Jersey Citizen's Guide to Government Archived April 7, 2017, at the Wayback Machine, p. 61, New Jersey League of Women Voters. Accessed May 30, 2017. ^ About Peck Archived December 14, 2012, at the Wayback Machine, The Peck School. Accessed December 19, 2012. ^ Our History Archived January 25, 2013, at the Wayback Machine, Delbarton School. Accessed December 19, 2012. ^ History Archived February 8, 2013, at the Wayback Machine, Morristown-Beard School. Accessed December 19, 2012. ^ Mindell, Cindy. "The making of a philanthropist – The Jewish community says farewell to David Chase z'l", Connecticut Jewish Ledger, June 8, 2016. Accessed October 19, 2016. "The Chases were among the original founders of the Rabbinical College of America, one of the largest Chabad Lubavitch yeshivas in the world, located in Morristown, N.J."
^ About Tiferes Bachurim Archived January 12, 2016, at the Wayback Machine, Yeshiva Tiferes Bachurim. Accessed September 8, 2015. ^ Transit Village Initiative Frequently Asked Questions, New Jersey Department of Transportation. Accessed September 6, 2014. ^ Morristown station, NJ Transit. Accessed September 6, 2014. ^ Morristown Line, NJ Transit. Accessed September 6, 2014. ^ "NJ Transit Restructures Morris County Bus Service; Four current 'MCM' routes will be expanded to six new bus routes", NJ Transit, September 13, 2010. Accessed August 8, 2015. ^ The Colonial Coach, Town of Morristown. Accessed September 6, 2014. ^ WMTR-AM 1250 kHz - Morristown, NJ, Radio-Locator.com. Accessed November 29, 2017. ^ WJSV-FM 90.5 MHz - Morristown, NJ, Radio-Locator.com. Accessed November 29, 2017. ^ Bzdak, Meredith Arms; and Petersen, Douglas. Public sculpture in New Jersey: Monuments to collective identity, p. 1949. Rutgers University Press, 1999, New Brunswick, N.J. ISBN 978-0-8135-2700-0. Accessed February 20, 2017. ^ Thomas Paine Monument Marker, Hmdb.org The Historical Marker Database, February 5, 2008. Accessed June 2, 2015. ^ Virtual Walking Tour of Historic Morristown Archived September 14, 2008, at the Wayback Machine, Morristown partnership. Accessed August 4, 2008. "Above the front entrance to the courthouse stands a wooden statue of Justice. She holds a scale to symbolize the balanced judicial system, and a sword to represent the protection of individual rights. Morristown´s statue of Justice is unlike most others because she is not blindfolded." ^ Staff. "Frank D. Abell Sr., Morristown Leader", The New York Times, November 23, 1964. Accessed October 19, 2018. "Morristown, N. J., Nov. 22 — Former State Senator Frank D. Abell of 28 Rosemilt Place, who was active in civic, government and banking affairs here for many years, died today at All Souls Hospital. He was 88 years old. Mr. Abell was born in Morristown and attended local and private schools here." ^ Miller, Randy. "Never a fan of Devils, Flames rookie/Jersey boy Kenny Agostino excited to play first NHL game close to home", NJ Advance Media for NJ.com, April 7, 2014. Accessed September 8, 2015. "Born in Morristown and raised in Flanders, Calgary Flames rookie left wing Kenny Agostino used to go to a lot of Devils games." ^ Staff. "Park commission seeks historic Speedwell mansion", New Jersey Hills, June 5, 2003. Accessed November 5, 2018. "After George Vail's death in 1875, children's author Joseph Bushnell Ames bought the property and built a cottage that still exists to use as his studio." ^ Michael Ashkin, Columbia University. Accessed September 8, 2015. "Michael Ashkin was born in Morristown, NY in 1955 and came to New York City in 1994." ^ Fox, Margalit. "William O. Baker, 90, an Adviser to Five Presidents About Scientific Matters, Dies", The New York Times, November 3, 2005. Accessed September 8, 2015. "William O. Baker, a prominent scientist and a former head of Bell Laboratories who advised five presidents on scientific affairs, died on Monday in Chatham, N.J. He was 90 and had lived in Morristown, N.J., for many years." ^ Schneider, Dan. "The Dan Schneider Interview 16: James Berardinelli", Cosmoetica.com, December 12, 2008. Accessed July 14, 2016. "I was born in New Brunswick, lived in Old Bridge for a year, then spent my childhood in Morristown and my teenage years in Cherry Hill. I went to college at the University of Pennsylvania in Philadelphia, then returned to New Jersey to live in Bridgewater, Hillsborough, and Mount Laurel, where I currently reside." ^ Collins, Arroe. "James Berardinelli Talks Oscars Unplugged and Totally Uncut", WRFX, February 25, 2016. Accessed July 14, 2016. "I was born in September 1967 in the town of New Brunswick, New Jersey (USA). I spent my early childhood in the town of Morristown, NJ." ^ Lisi, Clemente. "Exclusive: New Jersey's Vincenzo Bernardo signs with Austrian third-division club", New York Post, January 31, 2011. Accessed September 8, 2015. "Bernardo, 20, who was born in Morristown but also holds dual citizenship with Italy, signed the deal for an undisclosed amount after passing a physical exam over the weekend." ^ Schoen, David. "New Jersey's Scott Blumstein captures WSOP Main Event", Las Vegas Review-Journal, July 23, 2017. Accessed July 23, 2017. "Scott Blumstein wanted to play the World Series of Poker Main Event last year but couldn't afford the buy-in.... The 25-year-old professional poker player from Morristown, New Jersey, defeated Daniel Ott in a heads-up battle that lasted three hours to capture the $8.15 million first prize." ^ Bio: Brendan Buckley Archived October 16, 2007, at the Wayback Machine, RhythmTech. Accessed November 28, 2007. "Brendan Buckley grew up in the New Jersey area (Morristown and Mount Arlington) before moving to Miami to attend the University of Miami's School of Music." ^ Whitty, Steven. "Joe Dante on 'Burying the Ex,' N.J. and other famous monsters", ArtiSyndicate, June 14, 2015. Accessed July 29, 2015. "'The disappointing thing is that, you really don't make movies to be seen on people's computers,' says the 68-year-old director, born in Morristown and raised in Livingston." ^ Meoli, Daria. "That's Entertainment" Archived December 14, 2005, at the Wayback Machine, New Jersey Monthly, October 2005. Accessed December 26, 2007. "Find Me Guilty, shot in Newark, Bayonne, and Hoboken, stars tough guy Vin Diesel as Giacomo 'Fat Jack' DiNorscio, in the true story of New Jersey's notorious mob family the Lucchesis. Morristown native Peter Dinklage plays a defense attorney." ^ Havsy, Jane. "Morris swimmers dreaming of Olympic glory", Daily Record (Morristown), June 26, 2016. Accessed August 9, 2016. "Nic Fink has been dreaming about swimming in the Olympics since he was a kid growing up in Morristown, watching races on television.... 'It'll be a good race with some good competition,' said Fink, who attended Pingry School and the University of Georgia." ^ Chris Fletcher Stats, Pro-Football-Reference.com. Accessed November 6, 2017. ^ Kimmett, Evelyn. "Fosterfields Living Historical Farm", Skylands Visitor. Accessed November 11, 2014. "To enter Fosterfields, a working farm since 1760 and New Jersey's first living, historical farm, is to magically step back into the 19th and early 20th centuries. Walking amidst the tall Norway Spruces, it is easy to imagine life in the days of Caroline Foster, who lived there for 98 years, until her death at the age of 102 in 1979.... Fosterfields Living Historical Farm is located at 73 Kahdena Road, Morristown, NJ, just off County Route 510 (formerly Route 24), 1-1/4 miles west of the Morristown Green." ^ Tobin Heath, United States Olympic Team. Accessed October 19, 2016. "Birthplace: Morristown, N.J."
^ Markus Howard, Marquette Golden Eagles men's basketball. Accessed December 30, 2018. "Born March 3, 1999 in Morristown, New Jersey"
^ Woman Suffrage and World War I, New Jersey Women's History. Accessed January 7, 2018. "Julia Hurlbut of Morristown went to France in 1918 under the auspices of the YMCA where she managed an officers' club at Chatillon-sur-Seine and neighboring hut canteens for the troops." ^ National Aeronautics, Volume 16, p. 10. Accessed March 16, 2015. "Roger Kahn has no co-pilot and flies his Lockheed Electra all over the country, usually alone. ... He was born in Morristown, New Jersey, October 19, 1907, and although his early years were spent in studying music, he was scarcely out of his teens before he learned to fly and was engaging in competitive and exhibition flying." ^ Staff. "New Jersey native Nolan Kasper earns third trip to Olympics", Daily Record (Morristown), January 21, 2018. Accessed February 8, 2018. "Born in Morristown, Kasper began skiing at Hidden Valley in Vernon when he was 3 years old and raced for the first time at 6." ^ Staff. A Community Of Scholars: The Institute for Advanced Study Faculty and Members 1930-1980, p. 243. Institute for Advanced Study, 1980. Accessed November 22, 2015. "Knapp, Anthony William 68-69, 75-76 M, Lie Groups Born 1941 Morristown, NJ." ^ Ted Koffman's Biography, Vote Smart. Accessed July 24, 2018. "Birth Place: Morristown, NJ." ^ Staff. "Old Kountze Estate Sold; Physician Buys 400 Acres at Moristown, N.J.", The New York Times, March 2, 1924. Accessed January 3, 2011. "Dr. Nathan Blaustein of New York City has purchased the large estate formerly owned by the late Luther Kountze, known as 'Delbarton,' at Morristown, N.J."
^ "Seeking the Hide of Antoine Le Blanc, The Morristown Murderer", Weird NJ. Accessed October 19, 2016. ^ Guide to the David Hunter McAlpin Papers, New York Public Library. Accessed May 19, 2016. "McAlpin also owned a massive estate in Morristown, New Jersey (15,000 acres)." ^ Youngmisuk, Ohm. "Doherty's Putting the 'Fight' Back in Fighting Irish"[permanent dead link], New York Daily News, March 30, 2000. Accessed June 1, 2008. "'You can consider him a player's coach,' said Troy Murphy, a Morristown native and Big East Player of the Year." ^ Thomas Nast: America's Image Maker Archived July 10, 2007, at the Wayback Machine, Macculloch Hall Museum. Accessed July 24, 2007. "Thomas Nast moved his family to Morristown, NJ in 1870, believing it to be a safe distance from his political enemy, William "Boss" Tweed of New York. Although his work for Harper's took him weekly to New York for overnight stays, Nast was a full-fledged resident of Morristown." ^ via Associated Press. "Notre Dame star runner John Panelli dead at 85", WNDU-TV, March 4, 2012. Accessed March 15, 2018. "Panelli was born in Morristown, N.J., and played fullback and linebacker for Notre Dame's 1946 and 1947 national championshipteams, averaging 7.5 yards a carry his senior year." ^ Hall, Trish. "Sharing a Life Of Chefs' Hours And Pancakes", The New York Times, May 8, 1991. Accessed November 29, 2017. "Cooking appeals to her, she said, because it is instantly rewarding: 'It's like being able to take photographs and have them developed immediately.' But as a child in Morristown, N.J., she said, it never occurred to her to go into cooking." ^ "Andrew Prendeville to Drive One of Andersen Racing's Indy Pro Series Cars in 2007 ", Motorsport.com, January 25, 2007, backed up by the Internet Archive as of June 7, 2011. "Andersen Racing's Dan and John Andersen announced today that Andrew Prendeville of Morristown, N.J. will be one of their two full-season drivers in the 2007 Indy Pro Series." ^ Crespolini, Russ. "Person of the Year 2013: Sarah Price; We asked and you voted for the Morristown author whose battle with breast cancer inspired people worldwide. ", Morristown Patch, January 9, 2014. Accessed November 8, 2015. ^ Dan Quinn, Atlanta Falcons. Accessed November 5, 2018. "Quinn was born in Morristown, New Jersey." ^ Stewart James B. "The Real Heroes Are Dead; A love story. ", The New Yorker, February 11, 2002. accessed October 19, 2018. "In October, they decided to live together. In a development in Morristown, they found a town house with large glass doors and windows opening out onto a tranquil pond.."
^ Calzolari, Anne Marie. "Spank your children and you'll end up in jail", Staten Island Advance, March 8, 2008. Accessed February 20, 2017. "Jordan Riak, the executive director of Parents and Teachers Against Violence in Education, said the answer is simple: Any time you hit a child it constitutes some degree of abuse. Riak, a Morristown, N.J., native, now lives in California, where he helped draft and pass a 1985 bill that prohibits corporal punishment in school." ^ Staff. "Dr. William P. Richardson, Law School Dean, Is Dead", Brooklyn Daily Eagle, August 30, 1945. Accessed April 2, 2019. "Morristown, N. J., Aug. 30 - Dr. William Payson Richardson, 80, dean of Brooklyn Law School, died at his home on Kahdena Drive here last night after an illness of several weeks." ^ Fox, Margalit. "Tony Scott, Jazz Clarinetist Who Mastered Bebop, Dies at 85", The New York Times, March 31, 2007. Accessed July 23, 2012. "Anthony Joseph Sciacca — his family name is pronounced 'Shaka' — was born on June 17, 1921, in Morristown, N.J., to parents who had come from Sicily." ^ Varnell, Hannah; and Loevy, Robert D. "A History Of Gender At Colorado College", Colorado College. Accessed February 15, 2018. "It appears that the first woman with a Ph.D. to teach at Colorado College was Leila Clement Spaulding, who taught Classics from 1911 to 1914.... Leila Spaulding was born in Morristown, New Jersey, in 1878." ^ Havsy, Jane. "Morristown native to work Notre Dame sideline for NBC", Daily Record (Morristown), September 4, 2015. Accessed January 4, 2018. "Tappen grew up participating in many Morristown rec leagues and watching the NFL on Sundays with her family. A distance runner and basketball player at Villa Walsh, Tappen set the Rutgers record in the 3,000-meter steeplechase." ^ Jahmar Thorpe, Houston Cougars men's basketball. Accessed February 16, 2018. "Attended Morristown High School.... Born September 2, 1984, in Morristown, N.J."
^ Jyles Tucker Archived October 20, 2007, at the Wayback Machine, San Diego Chargers. Accessed November 21, 2007. ^ Harvard College Class of 1911 Decennial Report, p. 421. Accessed August 14, 2018. "Bayard Tuckerman Jr. - Born at Morristown, N. J. Apr. 19, 1889"
^ Scannell, John James. Scannell's New Jersey's First Citizens and State Guide: Biographies of the Notable Living Men and Women of New Jersey with informing glimpses into the State's History, Affairs, Officialism and Institutions 1919-1920 (Volume II), p. 634. J. J. Scannell, 1919. Accessed December 1, 2013. "Daniel S Voorhees - Morristown (32 Maple Avenue) - Lawyer. Born at Somerville, on August 15, 1852." ^ New Jersey Governor George Theodore Werts Archived September 27, 2007, at the Wayback Machine, National Governors Association. Accessed August 1, 2007. ^ Biography Archived July 21, 2006, at the Wayback Machine, Nancy Zeltsman. Accessed November 23, 2008. 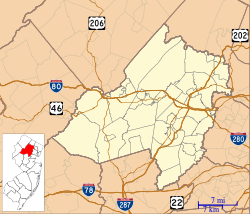 Wikimedia Commons has media related to Morristown, New Jersey. "Morristown" . The American Cyclopædia. 1879.